To Cite: Abasi I, Pourshahbaz A, Mohammadkhani P, Dolatshahi B. 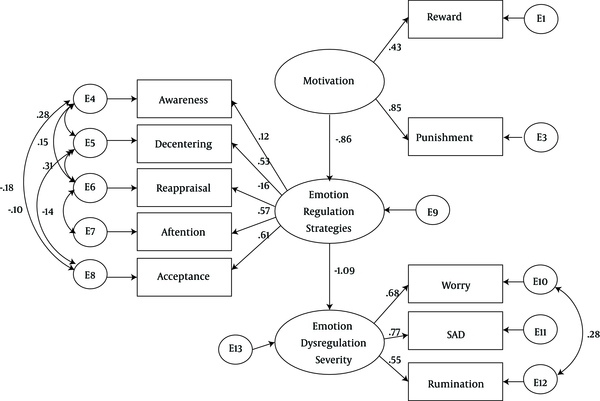 Mediation Role of Emotion Regulation Strategies on the Relationship Between Emotional Intensity, Safety and Reward Motivations with Social Anxiety Symptoms, Rumination and Worry: A Structural Equation Modeling, Iran J Psychiatry Behav Sci. 2017 ; 11(3):e9640. doi: 10.5812/ijpbs.9640. Background: Despite the widespread studies demonstrating the role of emotion regulation in social anxiety and distress symptoms, its mechanism and its relation to more biological basis like motivation is not well known. Objectives: Based on emotion dysregulation model, the present study aimed to assess mediation role of emotion regulation strategies on the relationship between, emotional intensity, safety and reward motivations with social anxiety symptoms, rumination and worry. Methods: Using Quota sampling, 524 participants were recruited from community sample and filled in questionnaires. Data were analyzed using structural equation modeling. Results: The results of SEM supported the mediating role of emotion regulation strategies (attentional control, decentering, awareness, reappraisal, and non-acceptance) in the relationship between motivation (reward and punishment) and emotion dysregulation symptoms (social anxiety symptoms, worry, and rumination). Model examination indicated the good fitness of the proposed theoretical model especially after omitting emotion intensity, as χ2=61.94, df=26, χ2/df=2.38, P < 0.001, CFI=0.97, GFI=0.97, AGFI=0.95, RMSEA= 0.05. Conclusions: These findings emphasize the possible important role of emotion regulation strategies and temperamental traits like motivation in the etiology of social anxiety disorder and their correlate distress symptoms. Copyright © 2017, Iranian Journal of Psychiatry and Behavioral Sciences. This is an open-access article distributed under the terms of the Creative Commons Attribution-NonCommercial 4.0 International License (http://creativecommons.org/licenses/by-nc/4.0/) which permits copy and redistribute the material just in noncommercial usages, provided the original work is properly cited. Emotion dysregulation has been demonstrated to play an important role in the development and maintenance of mood and anxiety disorders, including social anxiety disorder (1, 2). Social anxiety disorder (SAD) is the fourth most common psychiatric disorder (3). Lifetime prevalence of social anxiety disorder in the European community sample is 6.65% (4). In Iran, prevalence of anxiety disorders and social anxiety disorder in community sample has been reported to be 8.35% (5) and 0.82%, respectively (6). Social anxiety disorder is a debilitating condition that impacts the diverse indicators of quality of life, work/study, family, and social, and it is also associated with higher risk of suicide and developing comorbid disorder (4, 7, 8). Recently, a growing number of studies have focused on emotion and the emotion regulation processes in the psychopathology and treatment of social anxiety disorder (2, 9). Process model of emotion regulation posits that use of emotion regulation strategies varies according to context and goals in 5 distinct processes and individuals with SAD may have some problems in any of aforementioned processes (9). Moreover, social anxiety is characterized by exaggerated emotional reactivity and this heightened emotional reactivity is responsible for its comorbidity with anxiety and mood disorders (10). A recent model and treatment approach that has taken into consideration many aspects of emotion regulation is emotion dysregulation model (11, 12). Based on this model, one characteristic common to emotional disorders is negative affectivity, which is called emotionality or neuroticism, and or emotional intensity (12, 13). Motivational mechanisms are other characteristics in this model (safety and reward systems, (14). Safety system instigates avoidance of novel, painful, and threatening stimuli and reward system provokes pleasurable and goal directed behaviors (14). People with anxiety and mood disorders fail to form a balance between safety and reward systems and they are under control of especially power of safety system (12, 15). Emotional intensity and motivational intensity dysregulation are dispositional components of this model. Emotion regulation strategies are indicated as mediators in the emotion dysregulation model that can be differentiated according to the degree of cognitive effort required from less elaborative emotion regulation strategies (attending, acceptance/allowing) to more elaborative emotion regulation strategies (distancing, reframing/reappraisal) (12). Impairment in emotional components (emotional intensity and safety and reward motivations) lead to using limited emotion regulation strategies and finally narrow and rigid contextual learning. All these dysregulations at last prone individuals to anxiety and mood symptoms, worry, and rumination (12). Other factors that are explained in emotion dysregulation model as result of emotion dysregulation are worry and rumination. Worry and rumination as negative repetitive thoughts are engaged in the etiology and maintenance of emotional disorders and are used excessively in the presence of deficit in emotion regulation strategies and are ameliorated in result of psychotherapy (16). Emotion dysregulation model (11) is mainly postulated to explain the common processes in generalized anxiety disorder and major depression disorder; however, social anxiety disorder is highly comorbid with generalized anxiety disorder (17). Furthermore, people with SAD have difficulties in emotion dysregulation strategies including non-acceptance (2), reappraisal (18), attentional control deficits (19), and decentering (18). To our knowledge, emotion regulation variables and emotional intensity, motivation, social anxiety disorder symptoms, worry, and rumination have been examined in various studies. The mere description or comparison of emotion regulation strategies don’t shed light on mechanisms and how these different components work in relation to each other and to a specific disorder. So the aim of the present study is to investigate how emotional intensity and motivational mechanisms (reward and punishment) contribute to social anxiety symptoms and their correlate emotional problems (worry and rumination), which are considered as severity indices in this model through emotion regulation strategies. The hypothesized model, which the present study is going to examine, is shown in Figure 1. Using quota sampling, 524 participants (46.4% women, 53.6% men) were recruited from the community sample of Tehran, the capital of Iran. Participants were selected and classified according to statistical data obtaing from the statistical center of Iran. Data was gathered according to age, activity status, and education level, so that our sample had the same proportions of individuals as the entire population with respect to aforementioned phenomena. The frequency of this propotion is presented in the Table 1. Avaliable individuals who fit the quota table were recruited. Informed consent was obtained and all relevant ethical conditions were met in relation to participant’s rights based on the ethical guidelines approved by the university of social welfare and rehabilitation sciences. Then participants were asked to fill in a pool of questionnaires, which are indicated below. Participants were informed about the results of the questionnaires if they wanted. In relation to the adequate sample size for SEM, some researches report 500 cases to be very good (20) and others believe that SEM has 3 parameters (path coefficient, variance, and the disturbance term), and for each parameter, 10 cases are needed (21). Therefore considering these and attrition, 500 cases were adequate cases for present research. A total of 570 participants agreed to participate in the study. Eighteen sets of questionnaires were removed because of missing data. After cleaning up the data and removing the questionnaire with more than 5% of missing data and outliers (20), which could confound the analysis, 524 participants remained. The age of the participants ranged from 20 to 60 and the mean was 35.24 (SD = 10.71). In relation to marital status, 166 (31.70%), 343 (65.50%), 11 (2.1%) were identified as single, married, and dicorced, respectively and 4 (0/8%) of them didn’t identify their marital status. AIM (22) is a self -report 40 item-questionnaire, which assesses individual differences in affective reactions to typical life situations, as a stable dimension of personality. The reliability and validity of the questionnaire have been satisfying, with an alpha coefficient of α = 0.91 - 0.94 and test-retest of r = 0.80 (22). Internal consistency of AIM in the present study is α = 0.88 and CFA is as, χ2 = 535.94, df = 270, χ2/df = 1.98, P < 0.001, CFI = 0.95, GFI = 0.93, RMSEA = 0.04. (SPORQ) (23) is a self-report 48-item questionnaire with a yes and no response format and 2 subscales: sensitivity to punishment and sensitivity to reward. Internal consistency of 2 subscales have been reported to be α = 0.82.50 and α = 0.72.50, respectively (23). Internal consistency of punishment subscale and reward subscale of the present research is α = 0.84 and α = 0.74, respectively. CFA of reward subscale is as χ2 = 196.62, df = 128, χ2/df = 1.53, P < 0.001, CFI = 0.93, GFI = 0.96, RMSEA = 0.03 and CFA of punishment subscale is as, χ2 = 402.86, df = 245, χ2/df = 1.64, P < 0.001, CFI = 0.92, GFI = 0.93, RMSEA = 0.03. DERS (24) is a self-report 36-item scale and assesses the individuals’ general inclinations for emotion regulation across 6 facets. DERS demonstrates good internal consistency α ≥ 0.80 for each subscale and test-retest reliability r = 0.88 (24). Internal consistency of non-acceptance in the present study is α = 0.85 and CFA of this subscale is as, χ2 = 9.15, df = 4, χ2/df = 2.29, P < 0.05, CFI = 0.99, GFI = 0.99, RMSEA = 0.05. Non-acceptance subscale is used to measure acceptance. ACS (25) is a self-report 20-item questionnaire, which assesses attentional control and attentional shifting. The internal consistency is reported to be α = 0.88 (25). ACS has adequate psychometric properties in Iranian population (26). Internal consistency of ACS in the present study is α = 0.77 and CFA of this is as, χ2 = 168.54, df = 99, χ2/df = 1.7, P < 0.001, CFI = 0.95, GFI = 0.96, RMSEA = 0.03. BAQ is a self-report 18 item questionnaire, which assesses attentiveness to physical body process, awareness of body cycles and rhythms, ability to observe small changes in normal body functions, and ability to predict body feedbacks. Internal consistency of BAQ (27) has been reported to be α = 0.81 (men = α =0.77, women = α= 0.83) (27). Alpha coefficient in Iranian population has been reported to be α= 0.80 (28). Internal consistency of BAQ in the present study is α = 0.85 and CFA of this scale is as, χ2 = 127.67, df = 85, χ2/df = 1.5, P < 0.002, CFI = 0.98, GFI = 0.97, RMSEA = 0.03. EQ (29) is a self-report 11-item questionnaire, which assesses decentering. Internal consistency and test-retest reliability has been demonstrated to be α = 0.89 and r = 0.87 (29). Internal consistency of decentering in Iranian population was acceptable, α = 0.82 (28). Internal consistency of EQ in the present study is α = 0.84 and CFA of this scale is as, χ2 = 68.30, df = 34, χ2/df = 2.00, P < 0.001, CFI = 0.97, GFI = 0.97, RMSEA = 0.04. ERQ (30) is a 10-item self-report and consists of 2 subscales, reappraisal, and suppression. Internal consistency of reappraisal has been reported to be α = 0.79 (30). Reappraisal subscale is used in the present study. Internal consistency of reappraisal in the present study is α = 0.81 and CFA of this subscale is as, χ2 = 13.86, df = 5, χ2/df = 2.77, P < 0.01, CFI = 0.99, GFI = 0.99, RMSEA = 0.05. SIAS (31) is a 20-item self-report questionnaire. Internal consistency of SIAS in social phobia sample, community sample, and undergraduate sample has been reported to be α = 0.86, α = 0.95, and α = 0.85 (31). Internal consistency of SIAS in the present study is α=0.91 and CFA of this scale is as, χ2 = 190.99, df = 128, χ2/df = 1.49, P < 0.001, CFI = 0.98, GFI = 0.96, RMSEA = 0.03. PSWQ (32) is a 16-item self-report questionnaire assessing worry. It was demonstrated that the scale has very good internal consistency as α = 0.93 and high test-retest reliability as r = 0.74 - 0.93 (32). Internal consistency of PSWQ in the present study is α = 0.86 and CFA of this scale is as, χ2 = 132.66, df = 80, χ2/df = 1.65, P < 0.001, CFI = 0.98, GFI = 0.97, RMSEA = 0.03. RRS (33) is a 22 item self-report questionnaire, which assesses the individual’s tendency to contemplate in response to depressed mood. Internal consistency (α = 0.89) and 5 month test retest reliability has been reported acceptable (34). Internal consistency of RRS in the present study is α = 0.91 and CFA of this scale is as, χ2 = 253.69, df = 159, χ2/df = 1.59, P < 0.001, CFI = 0.97, GFI = 0.95, RMSEA = 0.03. After typical descriptive statistical analysis, a structural equation modeling technique was implemented to analyze the acquired database. Prior to the analysis, the database was assessed in order to meet the assumptions of outliers, multicollinearity, normality, and linearity. All assumptions were met. Therefore, SEM was performed. Motivation was measured by emotional intensity, punishment, and reward; emotion regulation strategies were measured by reappraisal, body awareness, acceptance, attentional control, and decentering; and emotion dysregulation severity was assessed by social anxiety symptoms, worry, and rumination. Data was analyzed using SPSS-23 and AMOS-23. Age range and descriptive statistics of demographic variables are presented in Table 1 and descriptive statistics for measured variables are demonstrated in Table 2. Matrix correlations of variables are reported in Table 3. First we analyzed the whole model, which is illustrated in Figure 1. The first SEM model parameters were adequate except, χ2/df was larger than the acceptable domain (χ2 = 142.12, df = 39, χ2/df = 3.72, P < 0.001, CFI = 0.94, GFI = 0.95, AGFI = 0.91, RMSEA = 0.07). So by reanalyzing the model and omitting the emotionality measure, the model fitness was improved. 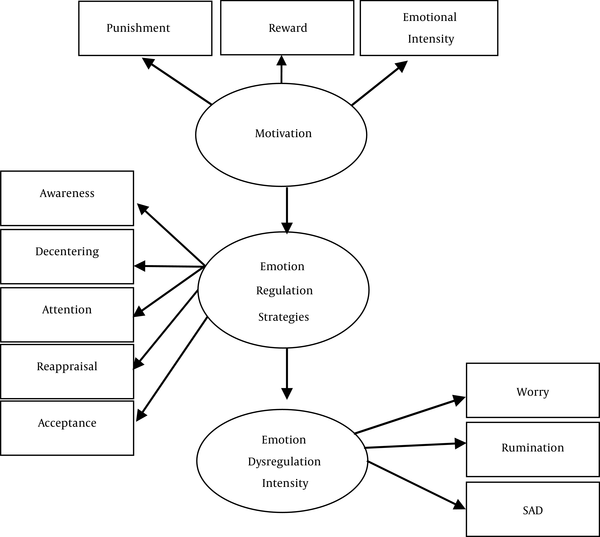 Figure 2 shows the hypothesized theoretical model of emotion dysregulation model, positing that motivation (reward and punishment) predict emotion dysregulation severity (SAD, worry, and rumination) via emotion regulation strategies (reappraisal, awareness, attentional control, acceptance, and decentering), and indicating indirect impact of the path. The significant standardized parameter estimates of the final structural model are shown in the model. The analysis of the structural model of social anxiety disorder symptoms, worry, and rumination resulted in good indexes of fitness: χ2 = 61.94, df = 26, χ2/df = 2.38, P < 0.001, CFI = 0.97, GFI = 0.97, AGFI = 0.95, RMSEA = 0.05 (20). Abbreviations: ACS, attentional control; ACT, acceptance; AIM, negative emotionality; BAQ, body awareness; EQ, decentering; FFMQ, mindfulness; PS, punishment sensitivity; PSWQ, worry; Reap, reappraisal; RRS, rumination; RS, reward sensitivity; SIAS, SAD. aHighlighted and underlined numbers: P < 0.01, underlined number: P < 0.05. Given that heightened sensitivity to punishment and reward, emotional intensity and emotion dysregulation mainly characterize social anxiety disorder (2, 35), the present study tested a hypothesized model of emotion dysregulation in a cross sectional research. As predicted, emotion regulation strategies mediated the relationship between reward, punishment and social anxiety disorder, worry, and rumination. Model fitness improved after omitting the emotionality measure from the model. This finding is exactly in line with previous researches that suggest that although emotion intensity is a common factor among mood and anxiety disorders, it is more related to GAD and depression and is more elevated in distress disorders (2, 36). The good fitness of model indicates the mediating role of emotion regulation strategies like decentering, acceptance, attention, awareness, and reappraisal in social anxiety disorder. This finding supports the literature indicating that emotion regulation underlies mood and anxiety disorders including SAD (1, 12). Worry and rumination as common repetitive negative thoughts are common among anxiety and mood disorders and the results of model fitness showed that emotion regulation strategies could predict worry and rumination with almost high beta coefficient: worry (B = 0.71), rumination (B = 0.56). Therefore, higher use of maladaptive emotion regulation strategies may lead to more severe worry as core feature of GAD, rumination as core feature of MDD, and symptoms of social anxiety disorder that is in line with previous studies (37). Most emotion regulation strategies were moderate to high associations with latent factor of emotion regulation strategies, except body awareness and reappraisal. One explanation is that previous studies in line with this finding showed that awareness demonstrates weaker relationships with emotion regulation variables and isn’t significantly different between clinical (GAD and SAD) and nonclinical groups (2). Another explanation is that, reappraisal might be a multi-facets construct that work differently with various goals and tactics and its sub-categories should be evaluated to best interpret its regulatory role (38). To explain the present findings more, function of motivational systems as basic, physiological correlate of emotion dysregulation, make people vulnerable to inflexible use of emotion regulation strategies and subsequent distress (for example, worry and rumination), and social anxiety symptoms. These findings are implicated in the recent Gross extended process model of emotion regulation (39). The present hypothesized model suggests that considering the bio-behavioral factors such as motivation systems may contribute to more precise case conceptualization and interventions for highly comorbid, chronic, and untreated disorders like social anxiety disorders that are comorbid with distress symptoms such as worry and rumination. Furthermore, emotionality is a higher order factor that seems more enhanced in GAD and MDD than SAD. A number of limitations in the present study suggest that findings should be interpreted with caution. One limitation may be self-report questionnaires, which are exposed to bias and as emotion regulation is a complex and multi-facet construct, future studies may benefit from using multi assessment procedure such as the emotion regulation interview (40) and neurobiological and physiological assessments like FMRI. Furthermore, the hypothesized model, assessed just limited emotion regulation strategies, which are almost related to negative emotion and examining positive emotion, which is capturing attention nowadays is another way to improve future researches on emotion regulation. This research is based on the first authors’ dissertation. Authors’ Contribution: Imaneh Abasi, Abbas Pourshahbaz, Parvaneh Mohammadkhani and Behrouz Dolatshahi conceived and designed the study. Imaneh Abasi acquired the data. Imaneh Abasi and Abbas Pourshahbaz performed the analysis and interpretation of data. Imaneh Abasi, Abbas Pourshahbaz, Parvaneh Mohammadkhani and Behrouz Dolatshahi drafted the manuscript. Imaneh Abasi, Abbas Pourshahbaz, Parvaneh Mohammadkhani and Behrouz Dolatshahi revised it critically for important intellectual content. Imaneh Abasi And Abbas Pourshahbaz performed the statistical analysis. Imaneh Abasi, Abbas Pourshahbaz, Parvaneh Mohammadkhani and Behrouz Dolatshahi performed the administrative, technical, and material support. All authors read and approved the final. Funding/Support: This research did not receive any specific grant from funding agencies in the public, commercial, or not-for-profit sectors.